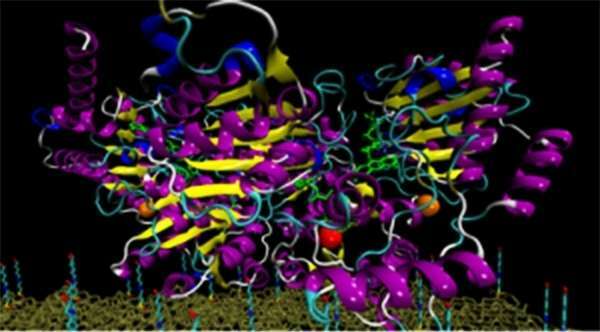 The nanobiosensor was developed at the Federal University of São Carlos (UFSCar), Sorocaba, in partnership with the São Paulo Federal Institute of Education, Science & Technology (IFSP), Itapetininga, São Paulo State, Brazil. It was originally designed to detect herbicides, heavy metals and other pollutants. An article about the nanobiosensor has just been published as a cover feature by IEEE Sensors Journal. "It's a highly sensitive device, which we developed in collaboration with Alberto Luís Dario Moreau, a professor at IFSP. "We were able to increase sensitivity dramatically by going down to the nanometric scale," said physicist Fábio de Lima Leite, a professor at UFSCar and the coordinator of the research group. The nanobiosensor consists of a silicon nitride (Si3N4) or silicon (Si) nanoprobe with a molecular-scale elastic constant and a nanotip coupled to an enzyme, protein or other molecule. When this molecule touches a target of interest, such as an antibody or antigen, the probe bends as the two molecules adhere. The deflection is detected and measured by the device, enabling scientists to identify the target. "We started by detecting herbicides and heavy metals. Now we're testing the device for use in detecting target molecules typical of nervous system diseases, in partnership with colleagues at leading centers of research on demyelinating diseases of the central nervous system." The migration from herbicide detection to antibody detection was motivated mainly by the difficulty of diagnosing demyelinating diseases, cancer and other chronic diseases before they have advanced beyond an initial stage. The criteria for establishing a diagnosis of multiple sclerosis or neuromyelitis optica are clinical (supplemented by MRI scans), and patients do not always present with a characteristic clinical picture. More precise diagnosis entails ruling out several other diseases. The development of nanodevices will be of assistance in identifying these diseases and reducing the chances of false diagnosis. The procedure can be as simple as placing a drop of the patient's cerebrospinal fluid on a glass slide and observing its interaction with the nanobiosensor. "If the interaction is low, we'll be able to rule out multiple sclerosis with great confidence," Leite said. "High interaction will indicate that the person is very likely to have the disease." In this case, further testing would be required to exclude the possibility of a false positive. "Different nervous system diseases have highly similar symptoms. Multiple sclerosis and neuromyelitis optica are just two examples. Even specialists experience difficulties or take a long time to diagnose them. Our technique would provide a differential diagnostic tool," Leite said. The next step for the group is to research biomarkers for these diseases that have not been completely mapped, including antibodies and antigens, among others. The group has begun tests for the detection of head and neck cancer.